1.1) How do I open a demo account? 1.2) How do I open a live account? 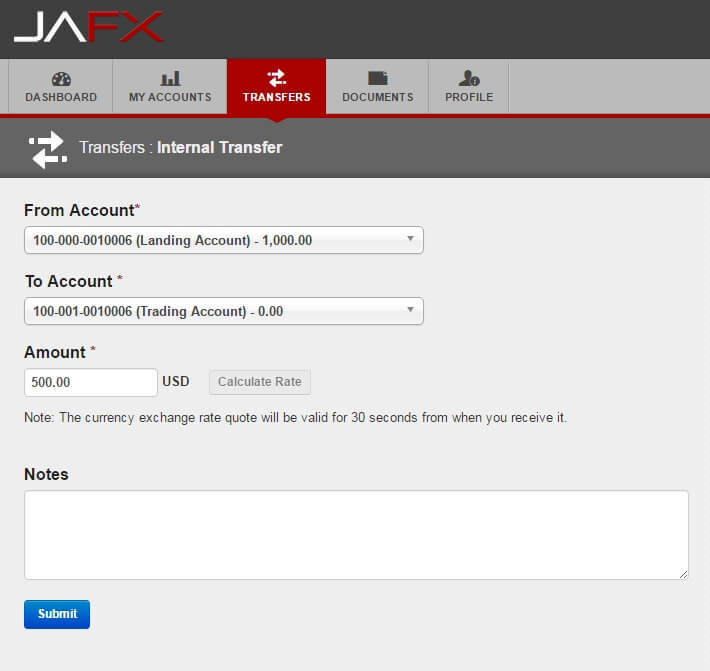 To open a JAFX trading account you simply have to visit the Open Account page and fill in your details. Once signed up you will be redirected to your JAFX Portal where you can log in with the details you signed up with. Each customer is only allowed one JAFX profile account in which you will be able to open multiple trading accounts. You may not open another account with a different email address. 1.3) How do I submit my verification documents? Once logged in you will need to submit your verification documents for each account you create. Please note we cannot accept screenshots and password protected files. Documents that look tampered with will be denied. Additionally, we can only accept PO Box Addresses if you are from one of the following countries: Bahamas, Brazil, Cayman Islands, Colombia, Cuba, Ecuador, El Salvador, Honduras, Jamaica, Kenya, Nepal, Nigeria, Paraguay, Saudi Arabia, Tanzania, Uganda or Venezuela. Temporary residence and work permit or paper ID cards are not accepted. Please note we cannot accept screenshots and password protected files. Documents that look tampered with will be denied. Clients under 18 years of age will have their accounts disabled instantly. You can upload your verification documents by navigating to the “Documents” tab in the JAFX Portal and then clicking on the “Upload Document” button. Once your verification documents have been uploaded, a member of the JAFX team will review and approve your documents and will send you email confirmation when this is complete. As a rule of thumb if you are not sure what to do, follow the information in the emails you receive or contact support. 1.4) How long does account approval take? Account approval typically takes less than 24 hours, however, we try our best to approve your account straight away. 1.5) How do I fund my account? You can fund your landing account by clicking on the “Transfers” tab. Then click on “Fund Account” from the right-hand menu. Select “Bitcoin” from the “From Account” drop-down. Select your “Landing Account” from the “To Account” drop-down. Enter the desired deposit amount into the “Amount” field. Optionally enter any notes you wish our support team to see in the “Notes” tab for when they approve your deposit. Click “Submit” you will then be redirected to our Bitcoin processing screen. On the Bitcoin processing screen, you will be presented with a Bitcoin address to send the Bitcoins to as shown below. Once you have sent the Bitcoins to the generated address provided on the Bitcoin processing screen, your deposit will be automatically credited to your account upon Blockchain approval. You can fund your landing account by clicking on the “Transfers” tab. 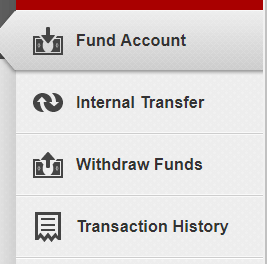 Then click on “Fund Account” from the right-hand menu. Select “Credit or Debit Card Via Instacoins” from the “From Account” drop-down. Select your “Landing Account” from the “To Account” drop-down. 1.6) How do I create a trading account? Once your KYC documentation is approved and you have successfully deposited into your “Landing Account” you will eligible to create as many trading accounts as you wish. A JAFX trading account can be used to trade manually through MT4 or you can plug your own EA’s to MT4 and trade automatically. Once you have clicked “Add Account” you will be redirected back to the “My Accounts” screen where you will be able to see your new Trading account. 1.7) How do I transfer my funds from my landing account to my trading account? To start trading you will need to move funds from your “Landing Account” to your newly created “Trading Account“. To move funds between accounts simply click on the “Transfers” tab and select “Internal Transfer” from the menu on the right. Enter the desired amount you wish to transfer into your trading account from your landing account. Alternatively, if you wish to transfer funds from your trading into your landing you will need to follow the above steps but select your trading account in the “From Account” and your landing account in the “To Account” drop down. 1.8) How do I withdraw my funds? Bitcoin deposits must be withdrawn in bitcoin. In order to withdraw your affiliate/IB commissions, it will first need to be transferred into your trading account. Unfortunately, our system cannot currently process withdrawals directly from affiliate/IB accounts. You can then withdraw your funds from your trading account using any of the methods mentioned below. Your account must be verified for your withdrawal to be approved. 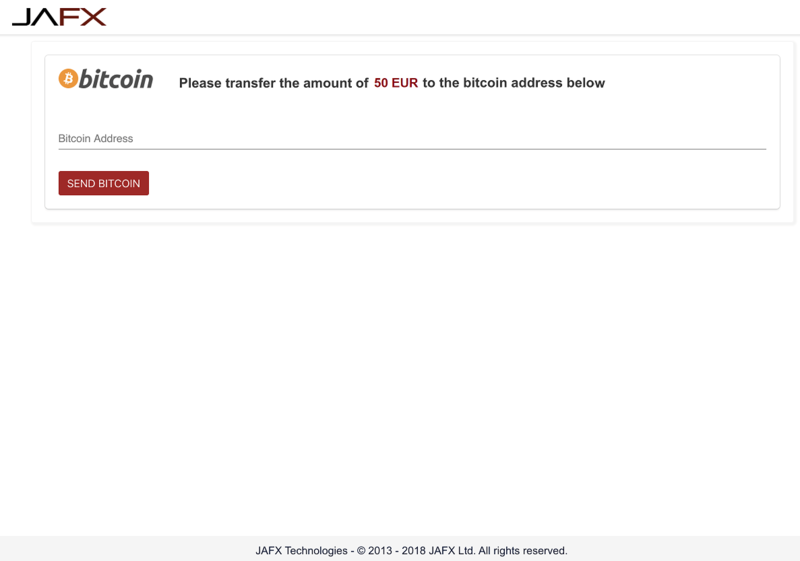 To make a withdrawal from JAFX via Bitcoin is a simple process, simply login to your JAFX portal and click on the “Transfers” tab. 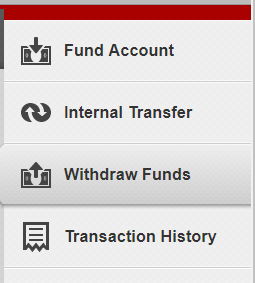 The click on “Withdraw Funds” from the right-hand menu. 3. Select your “Landing Account” from the “From Account” drop-down menu. Select your “Bitcoin” from the “To Account” drop-down box. Enter the amount you wish to withdraw in the “Amount” section. Optionally add any notes you wish our Support team to read whilst processing your withdrawal. Click on “Submit” to initiate your withdrawal. Please wait until you get to this page and paste your BTC address in there and click on Withdraw Funds. Please note that you will first have to make an “Internal Transfer” to your Landing Account if you wish to withdraw trading funds. You must first withdraw to the initial deposit method before withdrawing in any other method. 2.1) What deposit methods are currently available? 2.2) How much are the deposit fees? 2.3) What are the min and max deposit amounts? 2.4) How long does it take to fund my account? We accept wire transfers in USD. It can take up to 7 days for the money to land in your account. Important: You must include the MT103/Wire Receipt for your wire deposit, or we will be unable to process it. Please use the correct reference code provided. Failure to put the correct reference could result in your deposit being DELAYED OR RETURNED as it will not automatically be credited into your JAFX account. Please also be aware that you must send funds from an account in your name. If you are sending from a business bank account please provide us with details of the company so we are aware of any inbound fund. 2.5) Why are my funds not showing in my MT4 account? After you’ve successfully deposited funds into your landing account, they will need to be internally transferred to your trading or managed account before they will become available in MT4. Instructions for internal transfers are provided here (entry #1.7): https://www.jafx.com/faq. If you have already made the transfer and the funds are not showing in the trading account, log out and log back into MT4 to allow the balance to update. 2.6) What are the withdrawal methods currently available? Bitcoin deposits must be withdrawn back to bitcoin but profits can be withdrawn via bitcoin or wire transfer. 2.7) How much are the withdrawal fees? 2.8) What are the min and max withdrawal amounts? 2.9) How long does it take to withdraw? Wire Transfers take between 24-48 business hours to be processed however may take up to 21 business days to appear on your account depending on your bank. BitCoin withdrawals take between 24-48 business hours to be processed and are then approved to your wallet typically within 1 hour. 2.10) Do you offer any bonuses? 2.11) How would JAFX transactions show on my bank statement? Our transactions could show as either www.jafx.com, XTECHMARKETING, LIMITLESS X, TECH SAVVY, GLOBAL TRADE SOLUTIONS, MAJESTIC FINANCIAL UAB and Emblaze One on your bank statement. 2.12) How do I buy Bitcoin? 2.13) What is Source Name? This is the name of your bank you would like to use to deposit funds into your JAFX account. 2.14) What is the difference between a Beneficiary Bank and an Intermediary Bank? A beneficiary bank is the receiving bank where you have your account. Whereas the intermediary bank is a third party bank used by the beneficiary bank to facilitate international transfers. This means that if your beneficiary bank does not support international transfers they will be able to provide you with details of an intermediary bank you will be able to use in order to deposit and withdraw through wire transfer on your JAFX account. 2.15) Can withdrawals be made while trades are still open? 3.3) Do you allow hedging, scalping and news trading? 3.4) What is the minimum trade size? 3.5) What is the maximum trade size? 3.6) What is the maximum leverage JAFX offers? 3.7) What are the margin rules? 3.8) What time zone is used on JAFX? 3.9) Do you offer an online platform to trade? 3.10) Can I trade any system on JAFX? 3.11) What instruments can I currently trade on JAFX? 3.12) How many stocks can I trade on? 3.13) How can I report a problem with a trade? 3.14) Do you offer a VPS for lower latency? If you wish to set up a Virtual Private Server (VPS), when trading with JAFX, please see the following link: https://www.equinix.com/locations/united-states-colocation/new-york-data-centers/ny4/. This should lower latency and positively impact your trading experience with JAFX. 4.1) How can I register as an affiliate account? PLEASE NOTE you also need to have your affiliate account verified by supplying your KYC documents. See step 1.3 above as it will be the same process (but for your affiliate account). 4.2) How much commission can I earn if I bring people to JAFX? JAFX currently offers $2 per Lot RT per trade for any clients that you bring to JAFX. You will earn this commission regardless if the client trades manually or joins a “Managed Account“. 4.3) How can I withdraw my commissions? You can then withdraw your funds from your trading account using any of the methods mentioned in 1.8on the FAQ page. 4.4) Can I transfer my affiliate earnings into my trading account? 4.5) How/where do I log into my affiliate account? 4.6) How/where do I find my affiliate referral link? 5.1) What are my MT4 log in details? 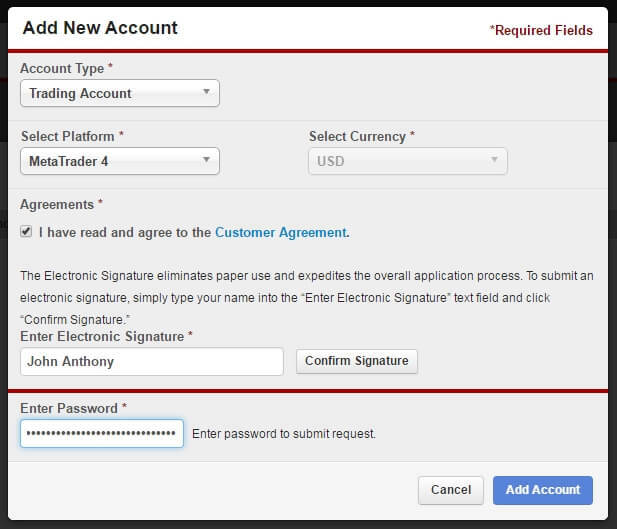 You’ll need to manually create a trading account under your main account to receive your MT4 login details. Instructions for doing that are provided here (see entry #1.6): https://www.jafx.com/faq. Please note, however, that the system will not allow you to create the account until you have uploaded your ID and address documents and have the account approved by our compliance department. 5.2) How do I reset my password? 5.3) Why am I unable to connect to my MT4 account? The “invalid account” / “authorization failed” / “unauthorized” message are always related to either password or incorrect server selection. Please be sure to select mt4.jafx.com (For branded use JAFX-Real3) as the server when logging in to a real account. For demo, the selection should be JAFX-Demo3. If the server selection is not the issue, please try resetting your MT4 password (see instructions in #5.2 of this list). 5.4) Are there any inactivity fees? JAFX charges an inactivity fee of $10 for clients with a non-zero balance which have not traded in the past 30 days. 5.5) What countries are restricted from using JAFX? Burma, Ivory Coast, Congo, Cuba, Germany, Iran, Iraq, Japan, Lebanon, Libya, Malta, North Korea, Somalia, Sudan, Syria, United States, Vietnam, Zimbabwe. 5.6) Who are the liquidity providers? 5.7) What other services will JAFX offer? 5.8) Is telephone support available? Yes. Simply call the phone number on the “Contact Us” page or submit a support ticket there and request a call back. 5.9) I am a bit confused, is there anyone that can help me? Yes, we have a dedicated customer support team on hand 24/365 to answer any questions you may have. Simply fill out the form on the contact us page, phone us, or chat with us via the LiveChat widget on the bottom right of our website. A member of our support team will happily assist you with any of your issues, questions, or concerns. Also, feel free to provide any feedback to help us improve!